It’s the first day of spring. 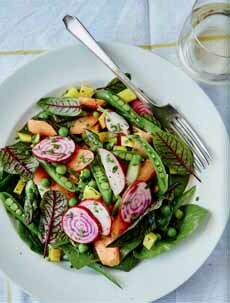 For a sprightly lunch or dinner dish, how about a spring salad with bagna càuda dressing? Bagna càuda is a classic sauce from the Piedmont region of Italy. It’s made from olive oil, anchovies and garlic. The name means “hot bath,” since it’s served warm. Bagna cauda is served with crudités, especially in fall and winter. It’s often part of a Christmas Eve buffet. In our own version, we add slices of toasted plain and/or baguette to the crudités plate—because bagna càuda is a zesty bread dipper, too. Bonus: Serve it as a piquant sauce with chicken and fish, poached or grilled. Bagna càuda dates to the Middle Ages, during the expansion of commerce between France and Italy. Among other items, Italian merchants began to import salted anchovies. A dip from Provence, anchoiade, is made with olive oil, garlic, white wine vinegar and anchovies. It likely crossed the border with the imported anchovies. The Piemontese adjusted the recipe to their taste, warmed it up, and created bagna càuda. For some time, bagna càuda was a food for ordinary people. It was not included in official Piedmontese cookbooks until 1875 [source]. Today, it is one of the most popular recipes to hail from the Piedmont region. Some simple recipes require simply that the anchovy fillets be mashed with the garlic cloves. They are then simmered in olive oil for a few minutes to take the edge off the garlic. The French had it right: The dip tastes better with a bit lemon juice or vinegar. Some versions add butter or cream. You can give it a different flavor profile with walnut oil. If you have truffle pieces (lucky you! ), toss them in. Here’s our version. Play with it as you wish. Use whatever looks nice and springy in the produce aisle. We didn’t include carrot curls in the ingredients list, for example; but any salad vegetable fits right in. 1. MAKE the dressing: Pound the anchovies and garlic into a rough paste, using a mortar and pestle. Place in a small saucepan, add the olive oil and butter and simmer over medium heat for 2 minutes, until the anchovies have dissolved. Add the optional chile flakes before removing from the flame. Alternatively, blend the oil, butter, anchovies and garlic in a food processor until smooth. To take the edge off the garlic, sauté the garlic cloves in some olive oil for 3-5 minutes. Spring salad with chioggia beets, from Foster’s Market Cookbook. 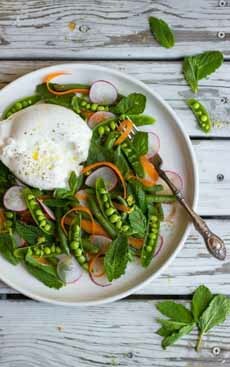 Spring salad with burrata, from The Gourmet RD. Here are more recipes for a spring burrata salad. 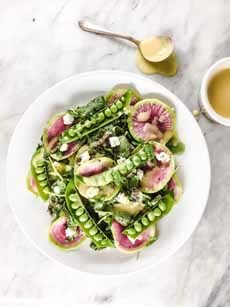 Spring salad with watermelon radishes, from Sid Wainer. 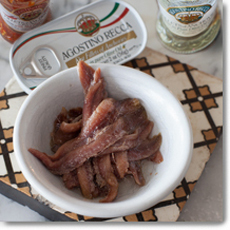 Buy the best anchovies you can find, for the best flavor in your bagna càuda. These are from Vital Choice. Chioggia beets are a specialty product. Like watermelon radishes, they add fun and fancy to a salad. 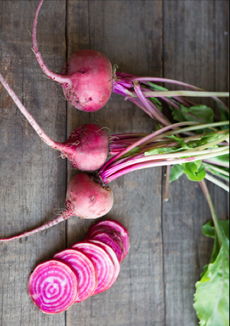 Here’s a recipe for a chioggia beet salad (photo courtesy Good Eggs). 2. TRANSFER Transfer to a small bowl and whisk in the lemon zest and juice. Set aside to cool. 3. ARRANGE the salad on individual plates or on a large platter, as you prefer. Set a scallion across the plate. Garnish with the eggs or cheese. Season lightly with salt and pepper. 4. WARM the dressing for 15 seconds in the microwave (or serve it at room temperature, if you prefer). Stir in the parsley right before serving. 5. DRIZZLE 1 tablespoon of over each plate of salad and put the remainder in a small pitcher for passing. Serve immediately. If the dressing is too garlicky for you, whisk in some crème fraîche, sour cream or plain yogurt. This fancy-looking dessert is quickly assembled from easily-available ingredients (photo courtesy Good Food On Montford). 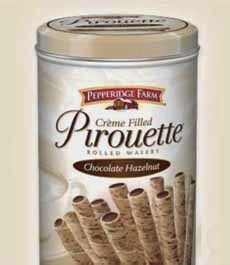 Pepperidge Farm Pirouettes, rolled wafer cookies, are an easy dessert garnish (photo courtesy Pepperidge Farm). It doesn’t take much effort to turn ordinary ingredients into a great-looking dish. This example (photo #1), from Good Food On Montford in Charlotte, North Carolina, shows how easy it is to turn basic ingredients into an ogle-worthy dessert. If you purchase all the ingredients, there’s no cooking required! 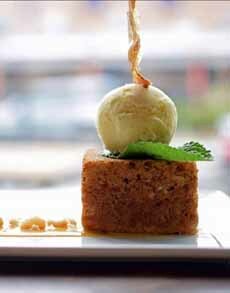 The snappy look of this dessert is created by the square of cake. A traditional slice of loaf cake, or wedge from a round cake, doesn’t have the same appeal. The denser the cake, by the way, the better. You can also use a brownie or other bar. In the recent past, we were looking for the “best” ham for our Easter dinner. As part of research for THE NIBBLE, we tasted six different hams and came up with the winner: Kurobuta ham from Snake River Farms. If you’ve been pondering a ham for Easter dinner (or any other time of the year), or want to send a memorable Easter gift (or Mother’s Day, Father’s Day, Christmas or any occasion), Kurobuta (pronounced koo-row-BOO-tuh) is the ham for you. Succulent, deeply flavorful and beautifully textured, it’s become the Easter standard at our house, and a mainstay of buffet dinners during the year. Kurobuta ham has been called the world’s best ham by chefs and food writers. Even at THE NIBBLE, when we have tasted 100 hot chocolate mixes, extra virgin olive oils, strawberry jams, etc., we know there are products out there that we haven’t known about. That being said, everything we’ve research and read has come up with no better ham. Made from pure-bred Berkshire pork, it’s also known as the Kobe beef of ham. That’s because of the fine intramuscular marbling that makes the meat melt-in-your-mouth tender. How good is this ham? Tender, with a perfect smoke and impeccable seasoning. Subtle notes of clove and other spices caress the tongue. 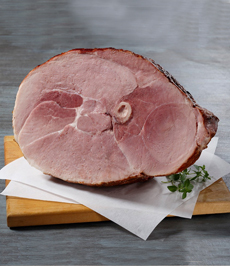 With other hams, even premium ones, the only thing that caresses the tongue is salt. Head to SnakeRiverFarms.com or phone 877.736.0193. Ham doesn’t get any better than this Kurobuta (photo courtesy Snake River Farms). Thick slices of ham are succulent and tender (photo courtesy The Chocolate Lab | SF). There are other Kurobuta cuts, including this rack of pork (here’s the recipe from Kita Roberts | Girl Carnivore). 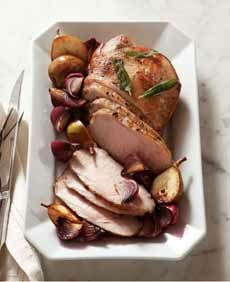 Boneless loin of pork (photo courtesy Williams-Sonoma). Hams are pretty durable. For best results, use the ham within 30 days after it’s thawed. In the freezer, they’re good for six months. The ham won’t go bad, but the flavor will start to decline. WHAT MAKES A GREAT HAM? It all starts with the quality of the pork. All Kurobuta hams are 100% Berkshire pork, a heritage breed. Kurobuta (the brand name for Berkshire pork), which means “black hog” in Japanese, is considered the pork equivalent of Kobe beef. Other important factors are the ingredients used to cure the ham. Kurobuta’s cure is a recipe that has been in the family for a long time. Kurobuta hams are “city hams” (the different types of ham), so they’re fully cooked. The smoking process is important. You want to add flavor, but not overpower the pork. Like all meat products there are different quality levels for ham. Some of the lower-priced hams inject water into the muscle to add weight and to distribute the salt and seasonings. This is a shortcut that makes ham cheaper, but not necessarily more delicious. Why is some ham so salty? Some of the classic Virginia hams are extremely salty. These “country-style” hams are intended to be that way. They’re generally sliced thin, like prosciutto, and served with an acidic condiment like mustard. 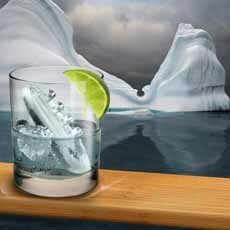 Something new in ice cubes: the Titanic hits the iceberg (photo courtesy The Caveman’s Guide). We have a quirky sense of humor. When we saw this quirky—some might say macabre or tasteless—ice cube mold, we had to have it. The mold makes cubes in the shape of the H.M.S. Titanic and the iceberg it unfortunately encountered. We like to keep surprising our guests, and these did it. We’re not so sure they’ll have the same impact the second time around, but there are always other guests. The shapes will be most noticeable in clear drinks: gin and tonic, Sprite, and the like. Two molds, a total of eight ships and eight icebergs, are just $7.99. We found them in The Caveman’s Guide which sells them on Amazon. March 17th, St. Patrick’s Day, is National Corned Beef & Cabbage Day. Corned beef and cabbage is a St. Patrick’s Day standard. But wait: The dish isn’t from Ireland, but from New York City’s Lower East Side. Although the exact beginnings of corned beef are lost to history, it most likely was created when people began preserving meat through salt-curing—an ancient practice. The dish has many regional variations and seasonings. Smoking a corned beef, and adding extra spices, produces pastrami. Historically, cattle in Ireland were not used for meat but for dairy products. Pork, affordable, was the predominant meat. It wasn’t until England’s 16th century conquering of Ireland that the cow became a meat animal—but its availability was limited to the Irish population because of the cost. 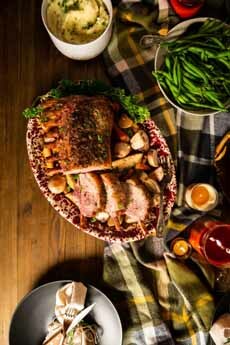 Then came the massive migration of Irish, Jewish and other populations from Europe to the U.S.
Corned beef was a staple in middle-European Jewish cuisine. Irish immigrants learned about corned beef from their Jewish neighbors on New York’s Lower East Side. In the U.S., pork was much more expensive than the American staple meat, beef. Brisket, which required several hours of cooking to tenderize, was an affordable cut. 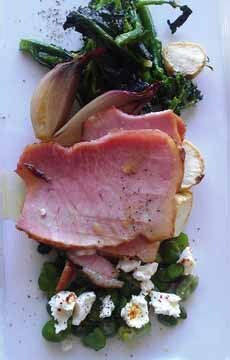 Irish-Americans substituted corned beef for the bacon, and and Corned Beef & Cabbage was born (photo #3). 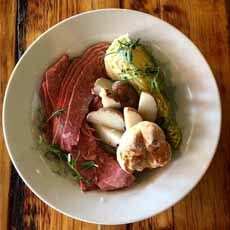 Corned beef and cabbage with potatoes and Irish soda bread (photo courtesy Chef Eric LeVine). 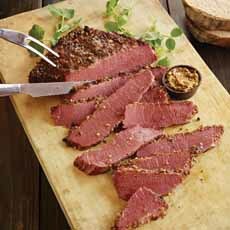 A brisket, transformed with into corned beef (photo courtesy Omaha Steaks). 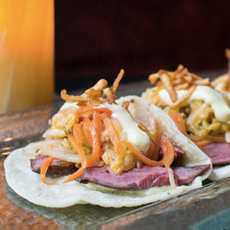 One idea for leftovers: corned beef and cabbage tacos. See the other recipes below (photo courtesy Tortilla Factory). 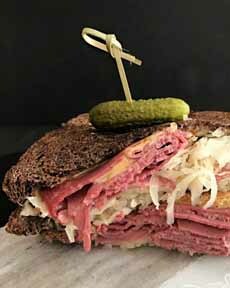 Make a reuben sandwich with leftovers. Since cole slaw is grated cabbage, dice the leftover cabbage and mix with mayo, shredded carrots, diced onions, vinegar, mustard, celery salt and a pinch of sugar (photo courtesy An Affair From The Heart).